As the International Whaling Commission holds its annual meeting, the BBC's Chris Hogg in Tokyo says that for Japan, the whaling debate is more about culture than science. Japan's government says its whaling fleet culled 863 whales last winter. The justification was science. Japan says it needs to collect data about whales - what are they eating? How old are they? Its government says it needs to kill the whales in order to examine them closely and ensure the data is accurate. Masayuki Komatsu is the executive director of the government-funded Marine Fisheries Research and Development Department. Like many supporters of whaling he gives two main reasons for the cull. "Whale is abundant," he says. "The number of fish is falling while the number of whales is rising. Surely the rapid increase in the whale population influences the level of the fish stocks? We need to know more about it." Secondly he cites culture and tradition. 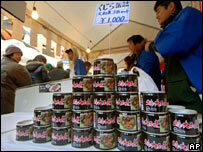 "Whaling has been conducted in Japan for more than 400 years to provide whale meat on a sustainable basis," he says. "The Japanese people, not just in whaling towns but in Tokyo and Osaka where many consumers are based, really appreciate whale meat as part of the riches from the oceans." Jeff Kingston, an academic who has studied the industry, is not so sure that is the case. This is "invented tradition", he believes. The support for whaling, he says, is rooted in more nationalistic traditions. "This has become a touchstone issue for Japanese people who are sick and tired of being pushed around and told what to do by other countries like the United States," he argues. "If the media and a few leaders tell them that whaling and eating whale meat is part of Japanese tradition and culture, people are willing to believe it." 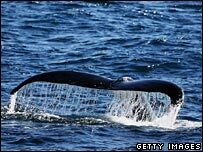 Privately some senior officials in government admit that whaling policy has been hijacked by a small but vocal minority. But such is the sensitivity surrounding this emotive issue they will not comment publicly. They set out the problem like this, though. No politician would suggest a change of policy on whaling. It would be too unpopular. The whaling industry, of course, has no interest in changing its ways. The public unless stirred remain pretty ambivalent about the issue, not strong supporters of whaling exactly but accepting of the status quo. That leaves a small vocal minority who keep up the pressure on policy-makers and on public opinion to ensure that the policy is upheld. At Japan's Ministry of Foreign Affairs, the Deputy Press Secretary Tomohiko Taniguchi insists that official support for the whaling industry is based on more than simply pacifying a small group of activists. "There is a right cause to be protected and the Japanese government is sticking to that right cause," he says. "There is a consensus in Japan that as part of the natural right for a sovereign nation it is perfectly right to continue whaling." But the reality is that when it comes to whaling, both domestically and internationally the arguments tend to be dominated by culture rather than science. "Whether or not [those defending whaling] are nationalists, this is a no-lose issue domestically," Jeff Kingston argues. "Emotions run high on this issue," he adds. "There is a heavy amount of 'emotionalism' that is couched in nationalist rhetoric." The risk for Japan's Foreign Ministry is that however well this might play for the government domestically, it does not play well with many of its allies abroad. Other nations including the United Kingdom have made official protests in recent weeks about Japan's policy of continuing whaling. Mr Taniguchi, while acknowledging that this is an important issue, tries to downplay its significance in terms of Japan's relations with its allies. "This is not an industry that dictates the national interest," he insists. "The whaling industry provides far less income than companies like Toyota or Nissan. So you have to put everything into perspective." The Japanese insist their ambition is simply to reform the International Whaling Commission to turn it from a battle-ground into a talking shop, where proper measures to conserve stocks can be agreed. Others, though, fear they are doing all they can to turn it into a pro-whaling body and that further down the line they are looking to overturn the ban on commercial whaling.